Theresa May’s Tories are in a perilous position following the General Election that stripped them of their majority. May called the snap election in the full expectation of increasing her majority and thus making the government untouchable in the House of Commons. Instead she found herself barely able to form a government at all, and had to turn to the Democratic Unionist Party to stay in power. 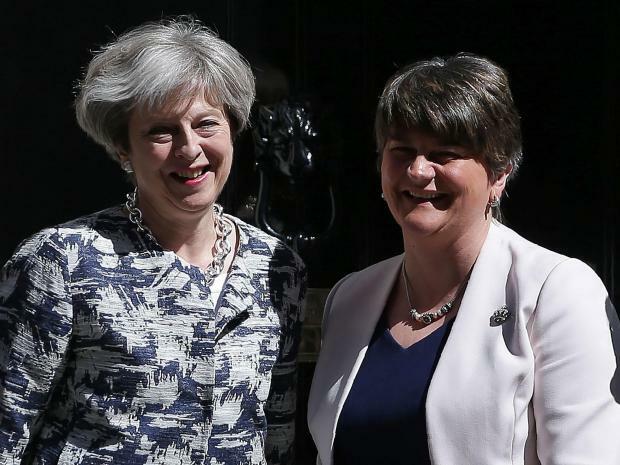 Since the prospect of a deal with the DUP was first mooted, the Tories have been the subject of intense criticism from not only the media and their political opposition, but from within their own party too. Speaking in the House of Commons on Thursday, Conservative MP Heidi Allen said “I can barely put into words my anger at the deal my party has done with the DUP,” and her words have been echoed across the country as concerns were raised not only about the DUP’s policies on creationism and equal rights, but the risk that the deal poses to the Good Friday Agreement. The Tories have already promised £1billion to the DUP to invest in Northern Ireland, and the confidence and supply arrangement can be reviewed by mutual consent at any time, with non-specified legislation to be dealt with on a case-by-case basis. Not only must the Tories now face the potential of being held to ransom by the DUP over the course of this parliament, but events this week surrounding the Queen’s Speech have shown the power backbenchers hold with a minority government in place. Labour MP Stella Creasy’s amendment on abortion rights for Northern Irish women held the potential to bring the government to its knees, and this Parliament is not yet even a month old. When the government’s majority is so slim even with the DUP on board, just a handful of defections from Tory backbenchers on a single opposition motion could bring the entire house of cards tumbling down. Far from strength and stability, the minority government of May’s making could fall at any time, and with the divisive issue of Brexit set to become the running theme of Westminster for at least the next two years, the potential for the Tory party to turn on itself cannot be ignored. They may have made it through their first Queen’s Speech this week, but the odds are markedly against this Tory government lasting the entirety of the five-year term. What is less clear is which of the many threats it faces will be the one to bring it down, but make no mistake. The sharks are circling, and May’s Tories are already only barely afloat between the Devil and the DUP.